could figure out how to make one ourselves by Easter time. be found at craft stores. Dollar Tree also has the wire. The larger roll of wire came from Michaels...it is about $4 (you could use a coupon) . The roll from Dollar Tree is only 6 feet long..you would probably need more than one roll. could be cut with pruning shears. made 15" long. That left 21" for the vertical piece. the carrot's greenery to. The two pieces were wired together. photo below) to use for hanging the carrot. the horizontal dowel to form the shape of the carrot. the carrot to be in the end. shape will be where you will attach poofs of deco mesh. wires to cross equally on both sides of the vertical dowel. the deco mesh is applied. The mesh is quite see-through. I just went on and painted the wire too. in a pattern similar to the picture above. Leave the "arms"
of the twist open to the front of the carrot. "hump" then onto the other side along the wire. that is where the foliage of the carrot will be attached. renovate a home on a hillside...it is just lovely now. to Karen's on a recent Saturday. Most of the deco mesh came from Hobby Lobby. mesh to use between attachment points to get a nice pouf. the mesh to get the pouf to look like you want it to. accordion folds across the width of the mesh. carrot in the end. It keeps you from having a "cowlick"
of deco mesh and helps the mesh not come loose also. the pinch/gather of mesh to hold it into place. mesh to make a "pouf". all be the same especially for this project. attach it on the "row" of pipe cleaners beneath your current one. you can adjust them to help cover the sides of the frame. Work across each row of pipe cleaners. are needed to get the look that you want. playing ball with him instead of making a mesh carrot. I'll show you some pretty things around her house. She has lovely vignettes all over her home. so we'll go back and take more photos. 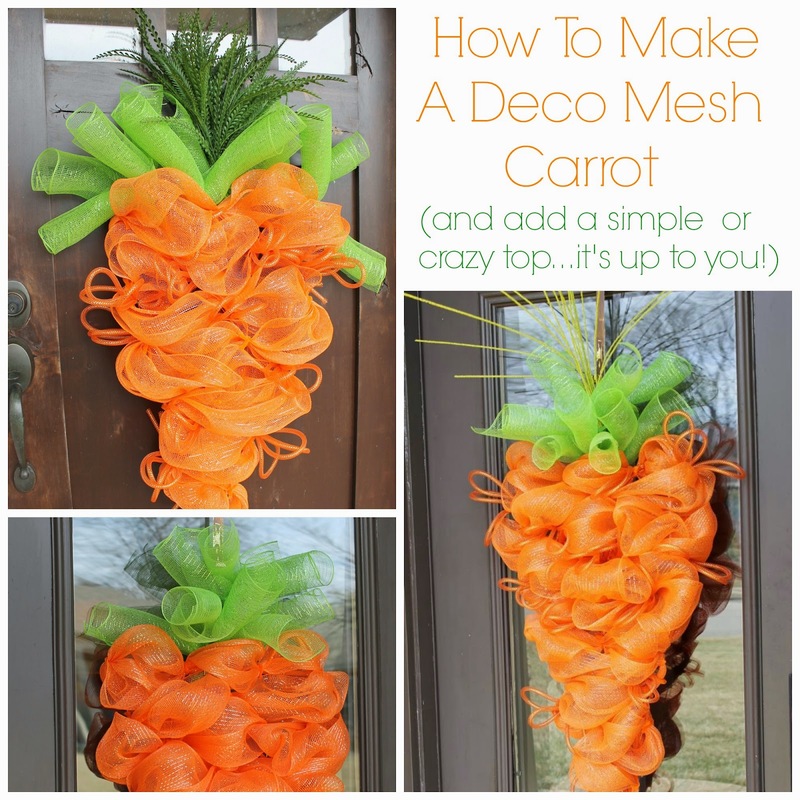 Leave a tail of deco mesh at the end of the carrot too. with a pipe cleaner or wire to the frame on the backside. 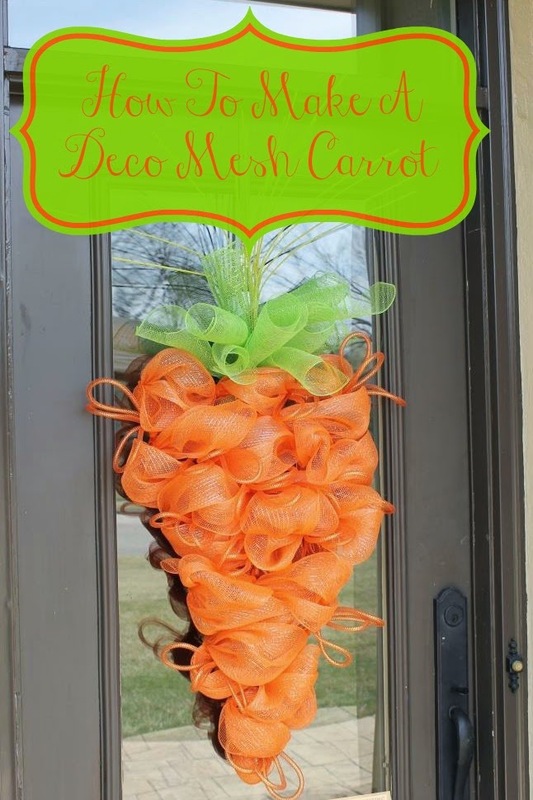 was that it had deco mesh tubing to represent carrot "hairs". deco mesh tubing orange...I thought it worked pretty well. 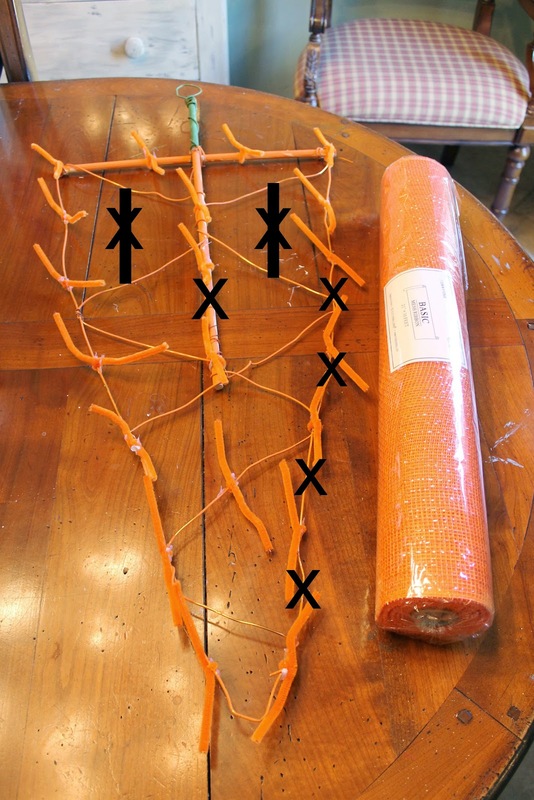 orange mesh tubing online from Mardi Gras Outlet. jute tubing so I got both to see the difference. tubing is in the background...it would look good with burlap. some "legs" to use to attach the loops to the carrot frame. Scatter several of the tubing loops through the carrot. They show up really well on the edges. you decide to use to make the carrot leaves. You can make tubes of green deco mesh by cutting 21"
pinch in the middle, then secure with wire or pipe cleaner. dowel or along the length of it like Karen did. can also add additional flair by using greenery too. Wire the greenery along the vertical dowel rod. on the carrot frame early on. Well this photo actually shows the loop before we added greenery. and fine tune the carrot shape . the street. The orange and green colors really "pop"
the same way as the first. frame, I felt like it needed more attachments points. want to add those to the frame ahead of time. ...leave a tail then tuck it. secured it with a pipe cleaner and attached it to the frame. ...very cute even without more embellishment. You would have some orange and lots of green mesh leftover. neighbors have already commented how much they like it. Make one for yourself...it's easy! So delightful Miss Kitty. Looks so pretty on your door. Excellent tutorial. Your daughter has a beautiful home and also did a great job of her carrot too. Thanks for sharing. Thanks for visiting Timeless Treasures with a nice comment. OMGosh! Your carrot is so much cuter than mine. I wish I'd seen your post before I tried making mine. Great tutorial,too. Thanks for the inspiration. The carrot is adorable and Karen has a beautiful home! I am loving her giant mirror. Was trying the carrot tonight, not as easy as you make it look. What gauge of wire did you use for the frame? I have 18 gauge on a roll but I can not get it to straighten out, it keeps wanting to curl. Getting aggravated. Am I using the wrong kind?